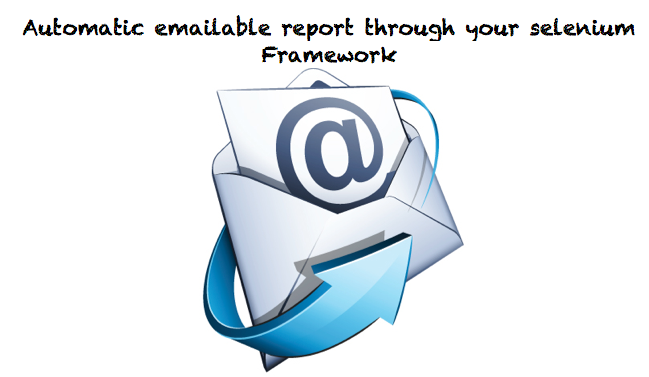 How to automatically trigger email with reports after execution ? or stakeholders after the selenium test execution has been completed. //The jar files which I have used are activation.jar and mail.jar Can be downloaded from Internet. //Object Instantiation of a properties file. The above Source code will do the job of triggering email after every execution. Where to how to use it? Add the below snippet at the end of the test execution report creation. With this the whole setup of automatic email triggering functionality is integrated with our framework. I didnt look for this, but I like this, found it enlightening! Keep up the great work! Cool. I am glad that it helps you. Glad to see that my blog is posted on the official Selenium blog. Thanks for pointing it out. I have updated the post with url to download. Please clarify above 2 things ,this would helpful to understand . Thanks assertselenium, it helped me a lot. i have mentioned my username and password correctly..but still it shows tis error…. Nice Blog.I am trying to send report from gmail id to yahoo id by using above code. Subject and attachments are coming in yahoomail id. But message text is not coming.My testscript has run successfully.Please look at this issue.Thanks in advance..
Can you explain this code once,that’ll be very helpful.. This code is working fine for me. But every time I execute my tests, it publishes the previous report via Email not the latest one. I am calling SendMail function in my teardown. I am facing the same problem. How you have resolved the issue. I want to send the email only when the test execution fails. This doesn’t works. Any thoughts! I think html report will complete its generation after AfterSuite function is implemented. if you call sendmail from after suite, probably html report would not have completed generating complete report hence does not work. Let After Suite finish executing and call sendmail separately. This could work for you. How can we send latest testng report. What you have return only sends the old report. can I have any idea, how to integrate with Jenkins cucumber report? I have location of the path where report generates and store, how can I configure to call this method. I’m getting error as below. Can you please provide a solution. Mine is a Non SSL port, for which I passed blank “” instead of “javax.net.ssl.SSLSocketFactory” and “starttls” as “false”. Have you got any solution for sending an automatic email once all test scenarios are executed using Java Cucumber. I found no one has implemented emailing the report automatically once all scenarios has been executed. I have custom HTML reports generated after my execution in Java cucumber. and I am making a call to send the email with the help of @AfterClass in my Testclass. how we use the above thing in selenium please help me on that. Make “TURN ON” then your application runs.